Broadcaster Bryan Dobson (second from right) presents (left to right) John Gallagher, representing the Erris community, Chris Reynolds, director, Irish Coast Guard, and Dr Keith Swanick, representing the Erris community, with a People of the Year Award. The community of Erris and Irish Coast Guard were jointly honoured at the People of the Year Awards, with special recognition for the crew of Rescue 116 which was lost off the Mayo coast in March of last year. 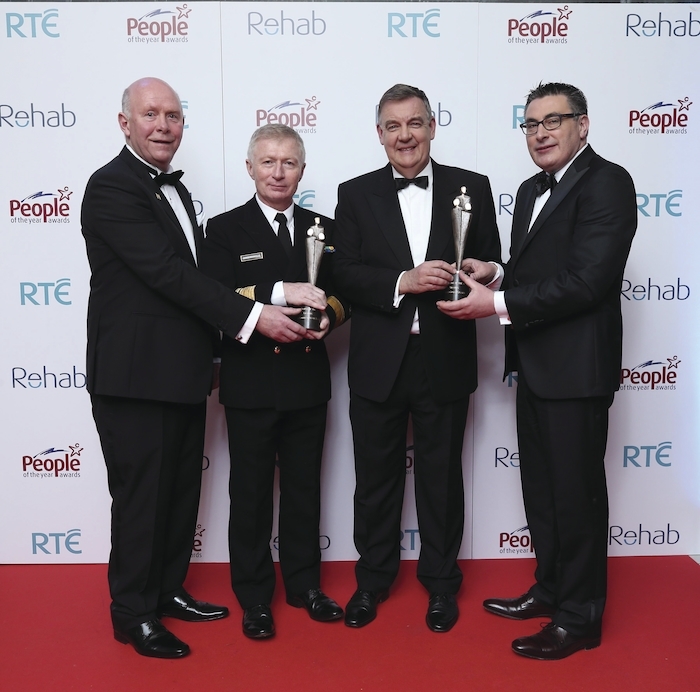 The honour at the 43rd People of the Year Awards, organised by Rehab, was presented by broadcaster Bryan Dobson in recognition of the heroic work of the men and women of the Irish Coast Guard in risking life to assist maritime and coastal communities, while the people of Erris were recognised for their contribution to the search for the missing crew. Volunteer member Caitríona Lucas, who lost her life off the Clare coast during a separate operation, was also honoured. It was early on the morning of March 14, 2017, that Coast Guard helicopter Rescue 116 disappeared off the north coast of Mayo. The aircraft had been providing communications support for an offshore medical assistance operation. On board were Capt Dara Fitzpatrick, Capt Mark Duffy, and winch team Paul Ormsby and Ciarán Smith. Hundreds of volunteers, fishermen, and colleagues supported the emergency services in combing the area for the missing crew, in a bid to recover the lost heroes. The bodies of Dara Fitzpatrick and Mark Duffy were recovered in the subsequent searches. However, tragically and despite intensive efforts, the bodies of Ciarán Smith and Paul Ormsby have yet to be recovered. Just six months previously, the Irish Coast Guard community had suffered another devastating loss with the passing of their brave colleague, volunteer member Caitríona Lucas, who had been participating in a search operation off the coast of Kilkee in Clare. Irish Coast Guard Search and Rescue operations manager, Gerard O’Flynn, said: “The selfless actions of those who put their lives on the line, for the safety of others, means Caitríona, Dara, Ciáran, Mark, and Paul will remain an inspiration to us all. "Going above and beyond is the norm for members of the Coast Guard service. The fact that these men and women often put their own lives in danger to carry out their duties makes the search and rescue crews such a remarkable group of people. Our colleagues will always be sadly missed and we remain deeply saddened by the depth of this tragedy. “I would like to pay tribute to the community of Erris who left no stone unturned in supporting one of the most extensive search and investigation operations ever conducted in the area. Every possible assistance was provided, ranging from the fishing community providing local knowledge and advice, shoreline searching and, in particular, the huge catering operation that was put in place to provide valuable sustenance to all participants. Page generated in 0.1525 seconds.